alaTest has collected and analyzed 85 reviews of Presto 02811. The average rating for this product is 4.2/5, compared to an average rating of 4.2/5 for other products in the same category for all reviews. Views about the noise and size are on the whole positive. The usability and price are also mentioned favorably, whereas there are some less positive views about the capacity and reliability. We analyzed user and expert ratings, product age and more factors. Compared to other products in the same category the Presto 02811 is awarded an overall alaScore™ of 79/100 = Good quality. Just received had not had a chance to use it. Purchased for Husbands' Art Studio. He loves it as do his customers! Many compliments on coffee w/Memories of Grandma! Great value! Allows me to make coffee as good and hot as my mother's. Brings back the memorys of the old days! Better Coffee than the others TRY IT YOU WILL LIKE IT!!! Very nice product - was surprised at how hot it keeps coffee! Its a nice coffee maker very happy with. But no filters had to hunt them down. Made from luxurious stainless steel. 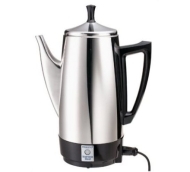 Makes 4 to 12 cups of rich, flavorful coffee automatically; a cup a minute. Signal light tells when coffee is ready to serve. Attractive, traditional styling - ideal for table service.